When the thought pops into your head, “I should make a note of that,” click the Notes button in the lower-left corner of the Outlook 2011 for Mac window, press Command-5, or choose View→Go To→Notes from the menu bar to display the Notes list. The Notes feature fills the need to make a quick note that gets added to your list of notes. Think of notes as a “stick-on notes” equivalent within Outlook. 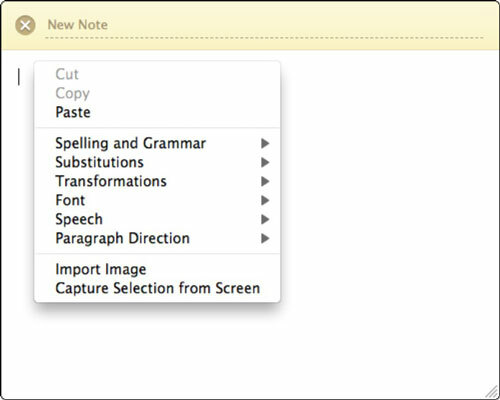 When you click the Note button on the Home tab of the Ribbon in Notes view, or if you choose File→New→Note from the menu bar, a New Note window appears. The New Note window is pretty bare — it’s meant to just hold a few lines of text. Start typing your note. You can also add nontext content to your note by right-clicking the note and choosing Import Image to open a file-browsing dialog. If you want to include a screen shot in your note, before you type anything in the note, right-click and choose Capture Selection from Screen. Drag diagonally over the screen to pop a screen capture directly into your note. To save a note, click the X at the upper-left corner of the note and then click the Save button. You might want to print a note or all of your notes. 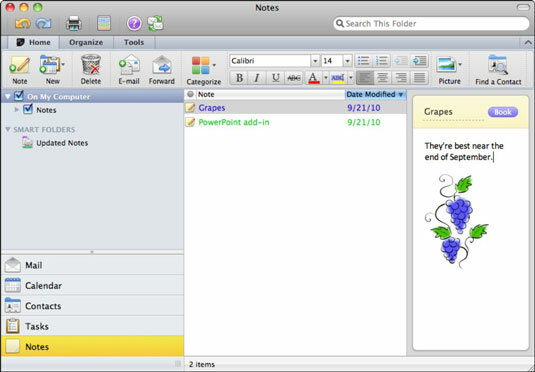 To print out a note or all your notes, while viewing Notes choose File→Print, click the Print button on the Standard toolbar, or press Command-P to display the Print dialog. 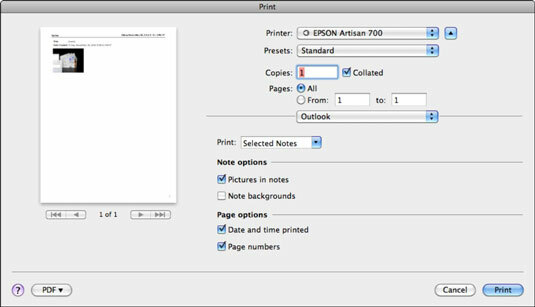 Choose whether to print the selected note or all notes from the Print pop-up menu and then select or deselect Note options and Page options as desired.